Carolyn Bassett is enjoying the new opportunities that have come in her later years, including the writing of her first book. Carolyn worked in Catholic hospital chaplaincy programs for ten years, and she continues to serve in various leadership and pastoral capacitiesas a member of the ecumenical community the People of Praise. She and her husband, Frank, have been married for fifty-two years and have two children, eleven grandchildren, and one great-grandchild. They live in Northern Virginia. Every season of our lives is filled with God's grace, but the aging process can cause believers to lose sight of the gifts that God offers each day. 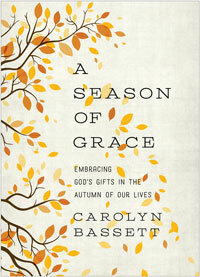 This book of seventy-five reflections can help older adults to remember all that God is doing in their lives.